Sip, Savor & See at Dreams Resorts & Spas! Your #FoodieFriday dreams can become a reality at Dreams® Resorts & Spas on your next getaway to paradise! As part of your Unlimited-Luxury® privileges, you have the option to Sip, Savor & See at participating sister hotels from 6 p.m. – 1 a.m. each evening! Enjoy top-shelf spirits, dinner and live entertainment during your dining experience. Keep reading to learn more about this delectable gourmet experience! You’ll have a one-of-a-kind dining experience at Dreams Resorts! Dreams Tulum Resort & Spa Receives the Cristal Certificate! Happy #TravelTuesday! We have some exciting news to share from a member of our family at Dreams® Resorts & Spas! We’re so excited to share that Dreams Tulum Resort & Spa has received the illustrious Cristal Certificate for their commitment to food safety at their resort. Keep reading for more info on this prestigious award! Staff at Dreams Tulum accept their Cristal Certificate for the FOOD CHECK category! A Dreams Resorts & Spas Thanksgiving! At Dreams® Resorts & Spas, we are always thankful for our wonderful guests! To show our appreciation to those staying with us this Thanksgiving, we wanted to give a little extra thanks to the guests who spent their time in paradise with us. On Thanksgiving Day, guests watched the annual Thanksgiving Day Parade and football games that were broadcasted throughout the day and into the evening. As the sun set on the day, all enjoyed a delicious, classic Thanksgiving feast prepared by our talented chefs! Read more to take a look at our Thanksgiving festivities at Dreams Resorts! Live entertainment on the beach for Thanksgiving at Dreams La Romana. As much as I love cooking shows, watching them on TV just doesn’t do it justice. You miss out on the little sounds, the different smells and obviously, sampling the food. 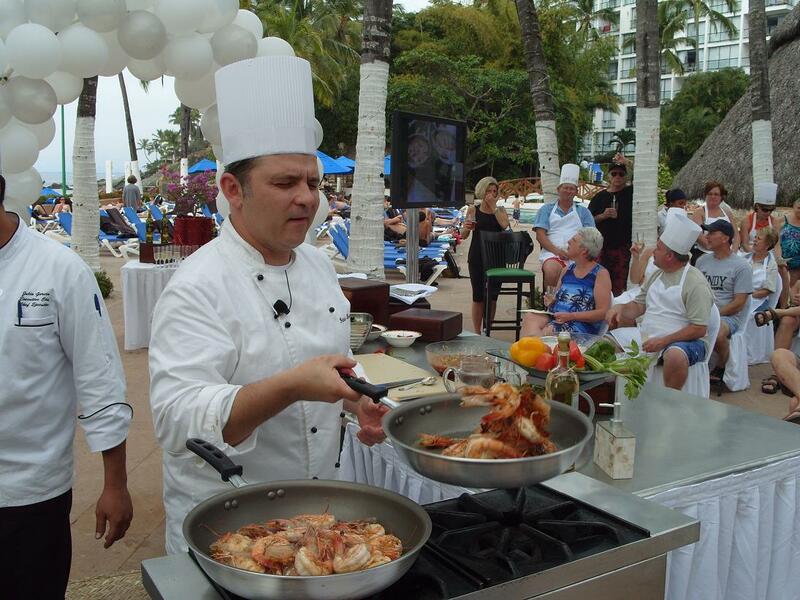 Guests at Dreams Puerto Vallarta get to have it all with the live cooking demonstration by guest chef, Patrick Loumagne. 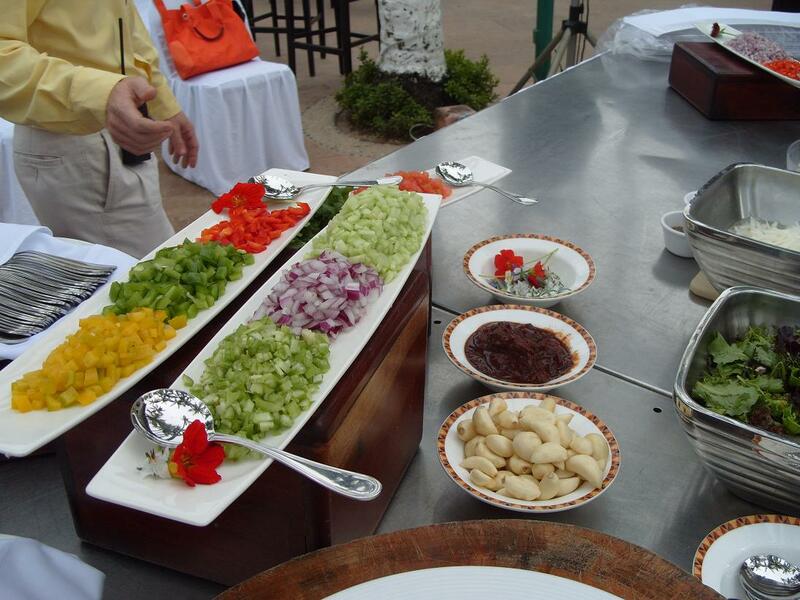 Chef Loumagne prepares dishes for a live audience of Dreams guests while cameras follow his every move. 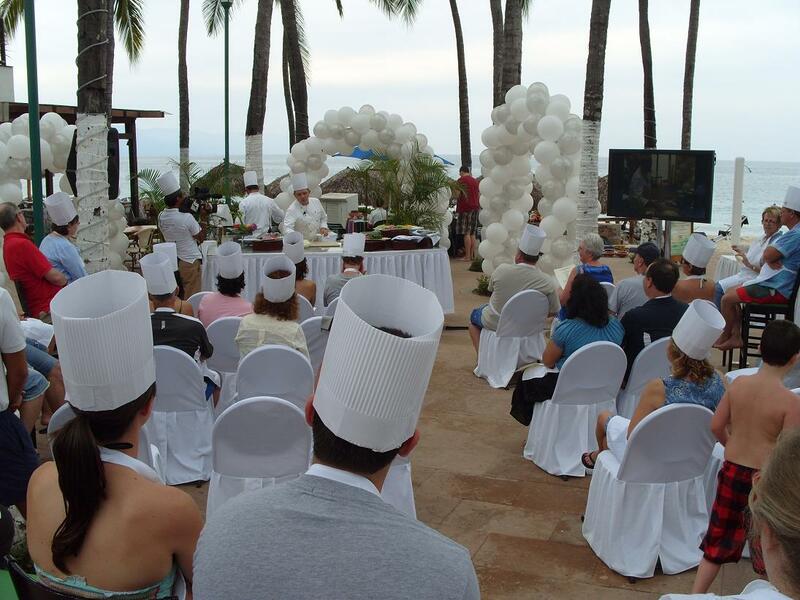 The audience is treated to the great camera angles while getting to experience the sounds, smells and flavors of the dishes that Chef Loumagne is preparing. With summertime heat upon us, cool down with this refreshing tropical drink from Dreams Puerto Vallarta. The Dirty Monkey is the perfect mid-afternoon treat or after dinner drink that will make you feel like you are sitting beachside. Blend together 1 cup of ice, 8 ounces of Pina Colada mix, 1 ounce of Kahlua, 1 ounce of vodka, and a half of a banana (that is were the monkey part comes in). Once blended till smooth, pour the mixture into a tall glass and top with chocolate syrup and whipped cream. If you want to escape to the tropics, but just can’t get away. This coconut shrimp recipe from Dreams Los Cabos will make you feel like you are there without ever leaving your home. First coat the shrimp in flour, then the wet batter and finally the bread crumb and coconut mixture.